English: Great Indian hornbill, great pied hornbill, giant hornbill, concave-casqued hornbill; French: Calao bicorne; German: Doppelhornvogel; Spanish: Cálao bicorne. 37.4-41.4 in (95-105 cm); female 4.74-7.37 lb (2.15-3.35 kg), male 5.72-7.48 lb (2.6-3.4 kg). Large, pied hornbill with long yellowish bill (usually dyed with preen oil) and a large, flat, double-pointed casque. Black with white plumage at head, wing coverts, and tail. 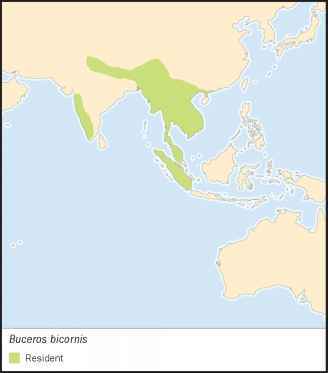 Southwestern India, southern Himalayas, east to Myanmar, south China and Vietnam, south down the Malaysian peninsula and Sumatra. 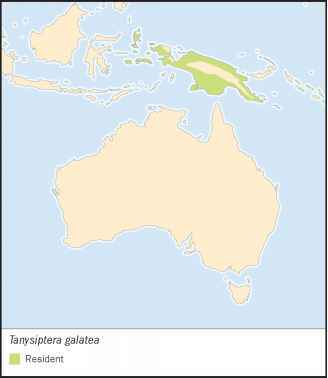 Prefers large blocks of primary rainforest but in Indonesia found on forest edge and in disturbed habitats. Generally found as resident pairs and believed to be territorial. Makes a variety of loud calls audible from more than 873 yd (800 m). When aggressive, bounces up and down on perch and flicks the bill. Feeds primarily in the canopy of fruiting trees, but also takes animal prey. Especially fond of figs. Nests high in large, forest trees, generally in January through April. Lays one to four eggs; incubation 38-40 days with fledging occurring 72-90 days after hatching. Female molts wing and tail feathers after sealing and emerges well before the oldest chick fledges. Considered Near Threatened and listed on the Convention for International Trade in Endangered Species' (CITES) Appendix II, prohibiting unauthorized possession, sale, or importation of living birds or their parts.